Source: Elliott Tool Technologies Ltd. Pulling the tube of a heat exchanger or boiler as a single piece could cause damage to the support sheet or tube sheet as the expanded tube end is drawn through the entire vessel. Cutting the tube allows the tube stub and the remaining length of the tube to be removed from their respective ends of the vessel, making the entire process easier and minimizing potential damage. 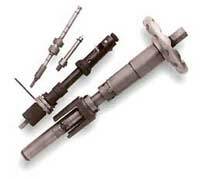 Elliott offers a complete line of tube cutters for tubes ranging from 5/8" to 4" OD. After new tubes are installed, Elliott's Tube End Facing Tool can trim projecting tube ends to meet precise manufacturer's specifications. Tube Facers can be driven by either an electric or air-powered motor. Tube End Facers are available in sizes for tubes ranging from 1/2" to 1-1/2" OD. Elliott Tool Technologies Ltd., 1760 Tuttle Avenue, Dayton, OH 45403. Tel: 937-253-6133; Fax: 937-253-9189.